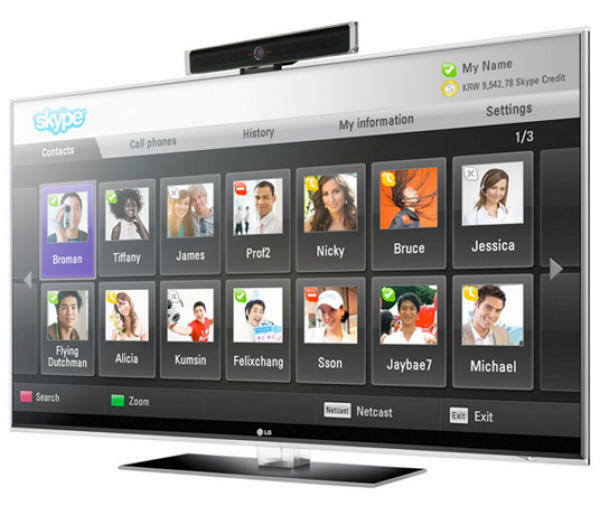 LG have announced 26 new NetCast HDTVs at CES 2010, each of which comes with Skype built-in. The new TVs will let you make Skype voice and high definition video calls directly from your TV without the need for a PC. Video conferencing has been something that hasn’t really caught on in the consumer space, presumably because it requires a PC and so has always been seen as a bit geeky. However, the TV is fundamentally different. It’s the one electronic gadget that everyone has and everyone understands. OK, a Skype HDTV may not be something that everyone has, but with 26 models featuring it, it’s clear that LG are serious about pushing Skype into the living room. Importantly, the user interface looks pretty slick too, which it’ll have to be if people are to start using Skype video calls in any significant number. LG’s Skype TVs will cover their entire range, including LED, LCD and Plasma. You’ll need to buy a separate video camera (which is an odd omission), but these are cheap enough and will plug into the NetCast TVs through a standard USB port. You might to avoid an HD camera though, particularly if you’ve got a huge HDTV. Having your Aunt’s ugly mug rendered in super high definition on a 60″ set in your living room might be too much for your kids to cope with!